It is possible to manage and even reverse diabetes through natural means, and in "Reversing Diabetes," Dr. Colbert shows you how. Most people view diabetes as a dead-end street--once you receive a diabetes diagnosis, your only option is to manage the symptoms with a restricted diet, close monitoring of blood sugar, and expensive medications. Dr. Colbert shows that diabetes can be treated instead through safe, natural means, like healthy food and vitamins rather than strictly relying on prescription drugs. He shows you how to manage your weight and your glucose intake with a whole-body approach, using nutritional supplements along with dietary and lifestyle changes to lose weight, repair cell damage, improve insulin function, and reduce the side effects from prescription drugs, many of which rob nutrients from the body and cause additional symptoms. Based on the same life-changing principles of the low-glycemic, high-fiber eating plan provided in Dr. Colbert's "New York Times "best-selling book, "Dr. Colbert's "I Can Do This" Diet," this audio book adapts that plan in a way that makes it ideal for diabetics who need to manage their glucose levels and their weight. 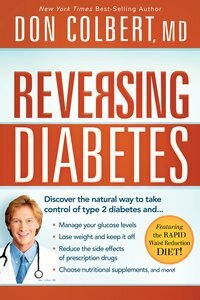 About "Reversing Diabetes (Unabridged, 7cds)"